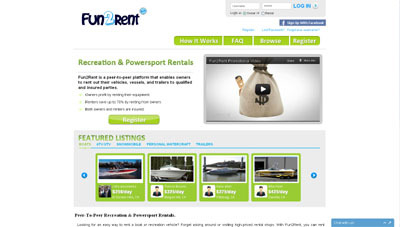 Rent boats and more from owners near you. Fun2Rent matches up vehicle owners and prospective renters then provides everyone the proper insurance. It is an easy, affordable way to find boat rentals, jet ski rentals, ATV rentals, dirt bike rentals, snowmobile rentals, travel trailer rentals and more close to home or in a popular vacation destinations across the United States. Owners of recreational vehicles, boats, jet skis, personal watercraft, ATV’s, travel trailers and more can also earn some extra cash by renting out these vehicles and vessels that would otherwise sit idle in their garage or driveway. Owners are earning more than $3,000 a season through our program. Low price rentals with Insurance.